In May of 2015, I had the opportunity to chaperone a group of college students to Italy. We had several daytrips scheduled including one to Venice on a Monday. I planned to visit the Biennale only to learn that the main venues of the international exhibit are closed on Mondays. I started thinking about the privilege of viewing this bi-annual show and the absurdity of fencing off world pavilions of contemporary art. In response, I made this series of hand-size reliquaries. Each one contains a plastic toy baby referencing the King Cake babies of my New Orleans childhood memories, seated atop a small pebble from my backyard rock garden. On the back of each structure is a different symbol: anchor, leaf, star, moon, and sun. I took the first four with me to Venice and reserved the last one for local exhibition. On Monday, May 18, 2015 in Venice, I was able to get time away from the group to venture to the Arsenale and the Giardini. Between 2:00 and 3:00pm, I looked for the right locations to leave the reliquaries. It was breezy so I chose sites that were somewhat shielded from the wind, but which were also appropriate places to pause for contemplation. I selected the following sites: 1) in the large anchor on the left, in front of the Museo Storico Navale, 2) in front of a bench, in the hooked root of a tree in the Giardini, 3) on the ground at the foot of the statue of Leda and the Swan in the Giardini, and 4) in the corner of the steps into the Rio del Giardini, just beside the bridge. At the Naval Museum, I was concerned about possible accusations of littering, but masked myself in a flurry of bumbling tourist behavior, dropping bags and snapping photos. Toward the entrance to the Giardini Venue I sat on a red park bench and placed the reliquary in secret, photographing it with All the Worlds Futures signage in the background. The sculpture of Leda and the Swan is in close proximity to the ticket kiosks for the Biennale, which were being guarded by the Carabinieri, and I worried about being questioned. I wasn’t. On the bridge near the fourth location, a man held a white flag with a gold circle in the middle. I asked about his flag and he told me he was marking the meeting point for a group to go (for free) by boat to the Lazzaretto Vecchio to see Herman de Vrie’s installation for the Dutch pavilion. He invited me to join them but I had to decline in order meet with my group at 4pm. It is my hope that someone finds these small art pieces and considers the implications. With the limited, off-the-beaten-track, public availability of my surreptitious exhibits, it is my intention to have others question the notion of accessibility to the art of today. The discovery of these works could be a stroke of luck or a serendipitous reward for keen observation and curiosity. 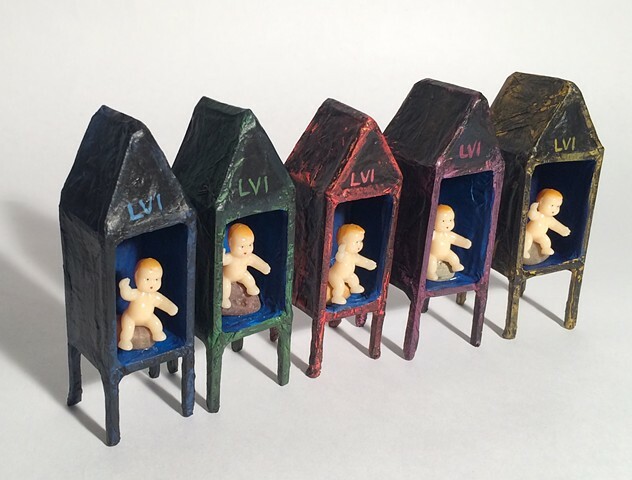 Unlike street art that makes a permanent mark in a public space, these temporary reliquaries are available for the viewer to acquire without cost and privilege.